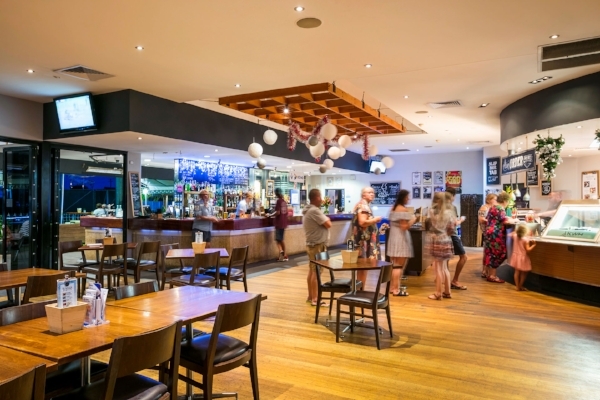 Our spacious Sports Bar is a punters paradise with full TAB facilities and multi vision screens throughout for all of those precious sporting moments. Counter meals are available for lunch and dinner 7 days a week from 11.30am - 2.30am and 5pm - 8.30pm. Live music in the sports bar every Friday and Saturday evenings from 9pm. We also have a sports bar menu available. Relax & enjoy one of our cocktail specialties in the cocktail bar. Open from 5pm Friday & Saturday Nights. Huge deck overlooking the gorgeous marina was one of many reasons why people choose the Kawana Waters Hotel over other hotels. It's also very central and there's always plenty of car parking available. Situated straight off the busy Nicklin Way, it's got the best access on the tourist strip.